These gluten free and keto Mexican wedding cakes are some of the easiest (and yummiest!) keto cookies around. Think just 5 ingredients and a handful of easy-peasy steps. The result? Melt-in-your mouth and totally aromatic cookies. In fact, these guys are some of the best Christmas cookies around the block. You’ll know what we’re talking about as soon as you take the first bite. After all, it really is no wonder these unassuming cookies are worldwide favorites. 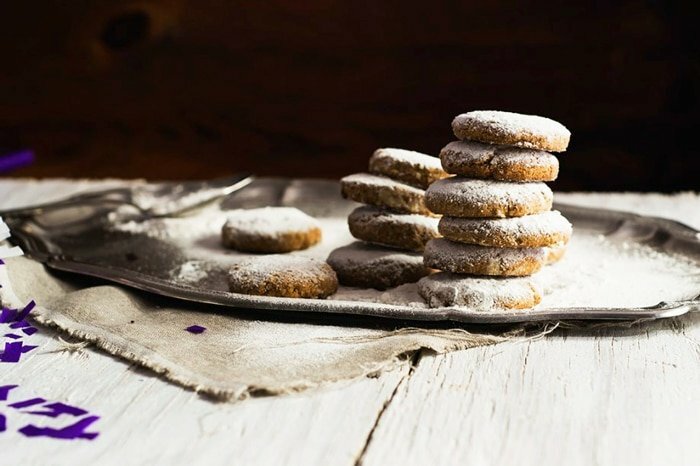 These might just be the cookies with a thousand names (Russian tea cakes, Mexican wedding cakes, polvorones, snowball cookies…). And their actual origins are very much muddled throughout history. With an almond version found in Russia, to a pecan one (with a light cinnamon sprinkle) hailing form Mexico. This keto version here is true to the Mexican origins (we’re half Mexican after all!). And down here, these scrumptious little cookies are known as polvorones. Which literally translates into crumbly ones. i.e. 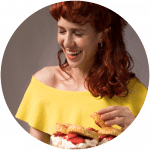 they’re supposed to crumble easily, even when held (which is why you’ll often find them wrapped up in colorful papers… all crumbled up inside!). 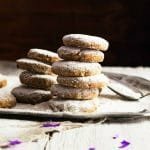 So the lack of gluten actually works in your favor here, and this version might just be easier than the original (where you have to be very careful with overworking the dough and developing gluten = hard cookies). You want them to actually melt in your mouth, rather than bite through them. 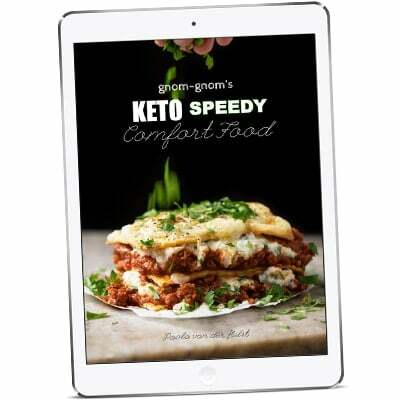 And this keto version does just that. And feel free to make them small (24 a batch) or large (12-15). These will also spread somewhat during baking, true to the original version from south the border here. 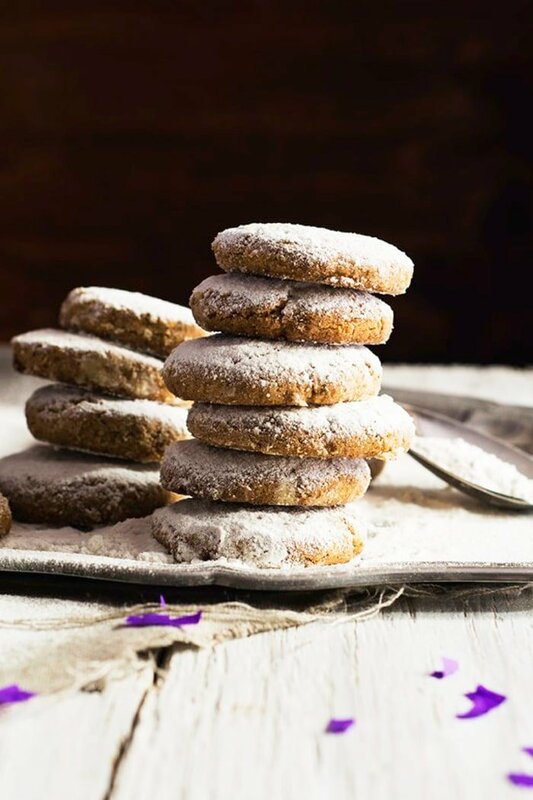 Mexican wedding cakes are traditionally a wheat cookie, with either pecans (the Mexican version) or almonds (the Russian version) thrown into the mix. So to make them gluten free and keto, we cooked up a version of the two and use both almond flour and finely ground pecans (i.e. pecan flour). Oh, and no xanthan gum or anything else required here, as we actually want the cookies crumbly and soft. The cookies themselves are lightly sweetened, to take into account the powdered coating after baking. The original version calls for 1/4 cup for the cookies themselves and 3/4 cup for the coating, to give you an idea of the exorbitant ratios. Having said that, we find that 2 to 4 tablespoons are more than enough to get the coating job done right. Think a light sprinkle on top, rather than an allover roll (which is simply too sweet for our tastebuds). Powdered Swerve or xylitol work best for the coating, and we’re also very keen on a pinch of cinnamon here. However, for the cookies themselves, Swerve or Pyure are the sweeteners of choice. But they must be powdered. Xylitol takes forever to dry out, so you end up with chewy cookies for aaages (think up to a day!). Add pecans to a food processor and process until finely ground, being careful you don't over-blend or you'll end up with pecan butter! Add pecan flour and almond flour to a skillet or pan, and toast over medium heat until golden and fragrant (3-6 minutes). Remove from pan, whisk in salt and set aside to cool completely (very important!). With your mixer on low, add in half of your nut flour mixture- mixing until just incorporated. Mix in the rest. Divide dough into either 24 small rounds or 12-15 if doing larger cookies. Place shaped cookie rounds on the prepared baking tray and place in the freezer for 15 minutes prior to baking. Bake for 13-15 minutes for the small ones or 17-20 minutes for the larger ones. The cookies will be deep golden, but very soft and fragile to touch. Sieve a touch of powdered sweetener with cinnamon on top immediately (it'll dissolve into the warm cookies). Allow to cool for 15 more minutes before adding more powdered sweetener. The cookies will become less fragile as they cool. Store in an airtight container for up to 1 week. *Or powdered Pyure (at half the amount). Please see section on Sweeteners for more deets on powdering and sweetening options. I can’t wait to try these. My mom used to make these every year for Christmas. It was one tradition I was really going to miss. Thank you so much for this great recipe! These got a dab cream cheese frosting instead of the sugar coating, but the cookies would be awesome all by their self. Awesome variation on a great cookie! I made these exactly as the recipe stated(except used Land-o-lakes butter instead of grass fed butter), weighing ingredients, etc. they were perfect!!! 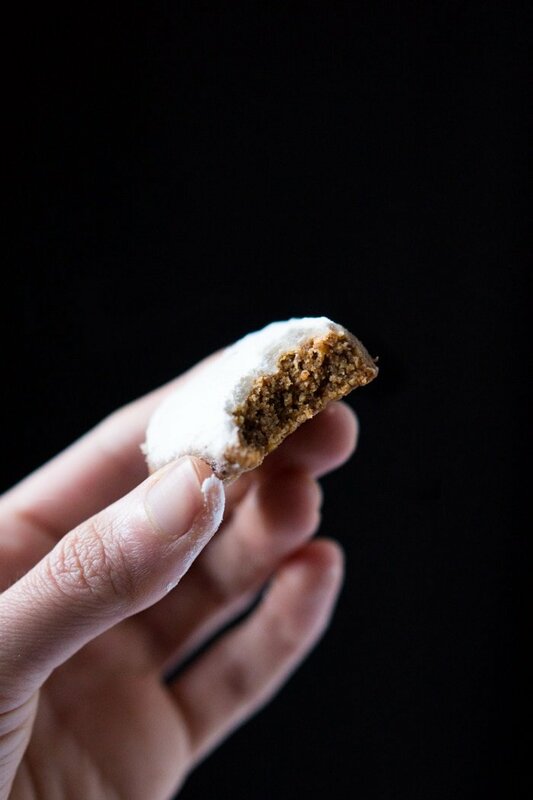 I would say my favorite low carb cookie I’ve ever made-and I’ve made a lot! Thank you so much for creating these recipes!!!! Can these be made into the balls rather than flat? If so same cooking time? These look great! Mexican Wedding Cookies have always been my favorite, and I can’t wait to introduce my GF kids to them! I need to know how many cookies are in a serving? I’m guessing it’s just one cookie, but want to be sure, since I have a Type 1 Diabetic. Is the nutrition facts for the large or small cookies? I’m making these now and after licking the beaters I know I’m going to want a few. Is the toasting of the flour for flavor? I used to make all the time (pre-Keto WOE) and I never toasted. Yup for flavor! But keep in mind that traditionally in Mexico we do toast the flours (even the wheat!) xo! It’s my absolute pleasure Judy! So happy to hear you enjoyed these guys so much (they’re probably my favorite cookie from my childhood!). xo! 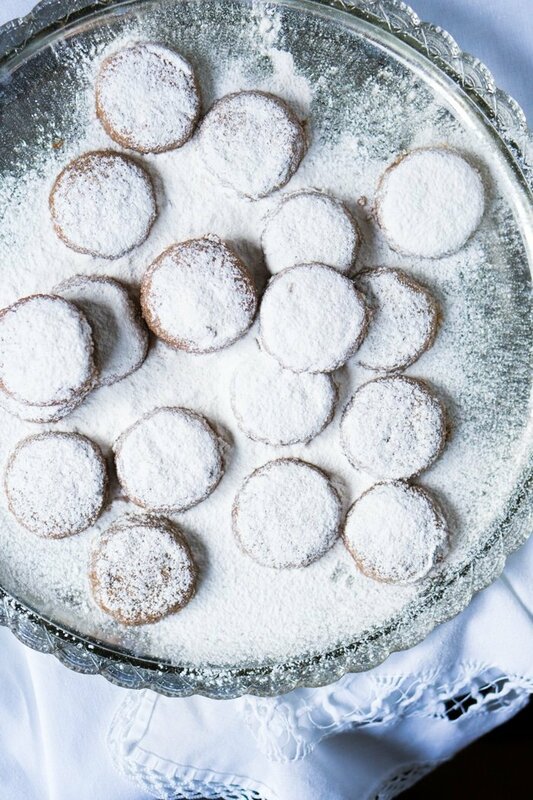 Can these be made with Icing sugar in areas of sweetener. If so what weight of sugar would be needed. Look great. Always on the look out for different Gluten free treats. I ordered the Swerve from Lucky Vitamin but it was stuck in customs and finally at the shippers instructions sent to abandon customs. I have requested a refund but bet I won’t get it. So I just placed an order with iherb and we will see what happens. They really do melt in your mouth! Without a doubt some of the tastiest cookies we have ever tried! Had to freeze half the batch to keep us from eating them, just couldn’t stop!!! I have pecan meal. Do you have a measurement for this (US measure)? Thanks so much!! Hi Liz, it’s roughly 2/3 cup! I live in Mexico – Merida YUC area – where can I find the Swerve here? It’s on Amazon but they won’t ship it to Mexico. I did a Google search on it and started checking everything for shipment to Mexico. I found http://www.luckyvitamin.com that will ship DHL express – 4-6 days. Shipping was almost as much as what i ordered. But I was determined to have this product. One of my greatest and fondest memories is the one of my grandmother’s Mexican Wedding Cakes – I loved them. It will be interesting to see how long it actually takes to get here. In the meantime I will check out iherb.com. Thanks for your response! It is about 30 pesos less on Iherb.com but they only ship postal – and that can take up to 8 weeks. Plus I have to stalk the Progreso post office to get it when it comes. There is no to the door delivery in the beach villages. My impatience was worth the extra costs from Lucky Vitamin. oh LOL! Don’t worry, slow postal service is not only a thing of beach villages…! I have to stock my post office as well 😉 thanks for letting me know where you bought it, I’ll check it out now as I hadn’t heard of it! Would these turn out okay without the pecan flour i.e. using more almond flour instead? Thanks! That’s why I grew up with, Elaine – Sand Tarts. I grew up in Alabama and Florida and have never heard them called Sand Tarts anywhere else but the Deep South. Regardless of the name, these are heavenly! 😳!!! QUE EMOCION!! I had no idea you were Mexican, these just made my day thank you! I wanted to write back, because we ended up making these last night and they were easily THE BEST polvorones we’ve ever had! The taste is simply so much more intense with the toasting, and I definitely get what you say about an aroma emerging as soon as you mix the nuts in with the butter. Simply WOW. Thank you for such a keeper Paola!